Egyptian Paste (also known as Faience) is a colored self-glazing clay, fired to 1900° F. Come experience the magic of this 3,000 year old process. First session will include demonstrations of marbling, forming and molding, then hands-on bead/ornament making. Final session includes stringing and assembling the fired beads into a finished piece. Please send or bring your $35 to cover materials, handouts and firing. Limit 6 per class. Rebecca Koop with her gang. Egyptian Paste (faience) is colored self-glazing clay fired to 1900 F. Come experience the magic of this 3000 year old process. Most people are familiar with the ancient turquoise scarabs and mummy beads. Class includes demonstrations of marbling, forming and molding, then hands-on bead ornament making. 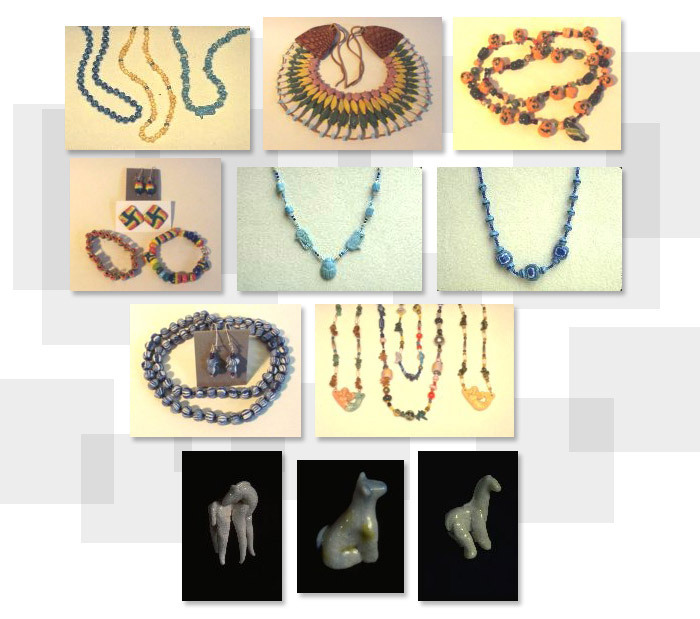 Participants can then string and assemble the fired beads they make into a finished piece.